vacancies in MGNREGA. Candidates have to send their applications through Speed Post or Registered post only to be reach on or before 05:30 PM of 05-12-2017. There are total 43 vacancies available in this current recruitment of MGNREGA Zila Panchayat Bastar District MGNREGA. Application form can be download from http://www.zpbastar.cgpanchayat.gov.in/ website. These vacancies are contract based only. Selection for this ZP Bastar vacancies will be based on merit in educational qualifications. 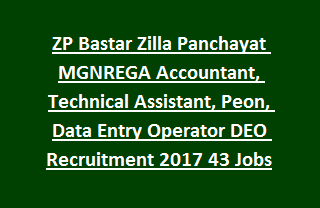 More details about ZP Bastar MGNREGA Recruitment of Accountant, Technical Assistant, Peon, DEO and Assistant Programmer vacancy details are given below. There are total 18 vacancies available in this MGNREGA recruitment of Sukma District. For Assistant Programmer-Computer Science or IT in B.E or B.Tech or MCA or MCM from a recognised university. For Peon post 5th class pass is required. For DEO 10+2 qualification required and DEO or Programming diploma of 2 years and English/Hindi with 8000 key depressions. For Assistant Grade 3- 10+2 qualification required and DEO or Programming diploma of 2 years and English/Hindi with 5000 key depressions. As on 01-11-2017 candidates minimum age limit is 18 years and maximum age limit is 35 years. Age limits are applicable as per government norms of Chhattisgarh Norms. Selection for this recruitment of MGNREGA will be held based on merit in educational qualifications, Personal Interview and Previous Experience. Based merit provisional list will be prepared for them only interview conducted. Experience-10% marks will be awarded. Candidates can download the application form from official website of Bastar District @www.zpbastar.cgpanchayat.gov.in. And filled application to be reach to the "officer of the Zilla Panchayat, Bastar District, Chhattisgarh " through Speed or registered Post only before 05:30 PM on date 05-12-2017. Along with applications form also send the all educational copies semester or year wise, Nativity certificate, experience if any and community certificate, date of birth certificate and any other related documents. .
Download notification and application form for ZP Bastar District MGNREGA Recruitment 2017.